In the annals of highly efficient and fast sports cars, the roaring twenties offered a classic. The bentley speed model was built for motorists who liked to tear it up on the often muddy and unpaved open roads of the day. It could also be handled effortlessly in city traffic and driven for long periods without breakdown rarities in those golden days of automotive ingenuity. Away we go captain w.o. Bentley, the mastermind of the speed model, was also responsible for the design of successful airplane engines. 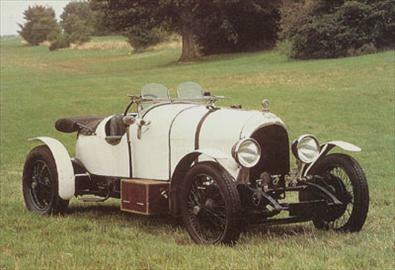 For this car, he found a way to lop thirteen inches off the standard bentley wheelbase. He added higher compression pistons, hartford shock absorbers, a single silencer and a close ratio gear box with higher back axle ratio. And he didnt ignore the details: A winged red bentley badge on the radiator, and functional antidazzle devices on the large headlights. back to the future priced steeply in 1925 at more than $4,000 for the chassis alone, the speed model was worth every penny. For just a little more, customers could buy a special version with an even shorter chassis that guaranteed a speed of 100 mph. In 1922, an open-chassis model was offered. One of a number of different bentley speed model bodies, this 1922 make was equipped with an outside toolbox, a common feature of the period..